The genocide in Rwanda, whose 20th anniversary is being observed worldwide this month, began only a few days after Easter. That the hatred that cost the lives of a million people in this overwhelmingly Christian country could be unleashed so near to Holy Week seems paradoxical, ironic or even blasphemous. Rutagengwa and his wife, Christine, survived the killing 20 years ago, taking refuge in the Hôtel des Mille Collines (the subject of the 2004 film “Hotel Rwanda”). Now residents of Nashua, N.H., and the parents of University of Notre Dame freshman student Christine Rutagengwa, they returned to Rwanda last December. Other members of the team, all of whom stayed at the Hôtel des Mille Collines during their visit, were Rev. Virgilio P. Elizondo, professor of pastoral and Hispanic theology, and Colleen Cross, project coordinator of Notre Dame’s Institute for Latino Studies. 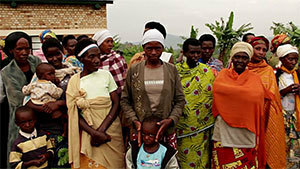 Father Groody’s research in Rwanda was funded by Notre Dame’s Kellogg Institute for International Studies and the Institute for Scholarship in the Liberal Arts. Originally published by Michael O. Garvey at news.nd.edu on April 15, 2014.